WORKSPACE + WORK/LIFE. COLLABORATION + COMMUNITY. We said last month that we have bigger plans for 2010 — to grow our community and our impact, to realize our larger vision. The workspaces that are probably the most tangible things about BEAHIVE are just means to several ends. But they are a key component of our model. And more space allows for more means and more ends. 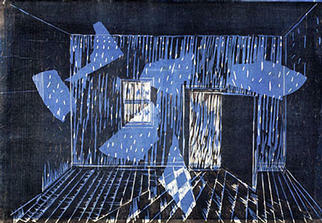 Which is why we've been aching to expand our Beacon location into the front room since we moved in. We need more members to do that. We could also partner with a like-minded group or business to share that space with us — a small gallery, a group of artisans who could display their wares there, a nonprofit that needs some space for its small staff, a group that just needs a regular place to meet. So if you know of anyone who may be a good fit, by all means connect us. And remember we have plenty of room for individual members and groups in Kingston. We have an ongoing need for interns (description) to help realize that larger vision. We particularly need someone soon to help plan and coordinate events in Kingston and/or Beacon. Spread the bzzz, please. Your message here! Well, not exactly here. But the buzz around BEAHIVE is ever-growing and we're looking for like-minded groups or individuals who want to tap into it. Reach a quality, engaged audience through our events, email list, newsletter, Meetup group, Twitter, etc. Contact Scott to discuss opportunities. Welcome to our final class of 16 Kingston Founding Members: technology counselor Gerald Berke; Carl Frankel — managing director of the Center for the Intimate Arts; IBM consultant Heather Johnston; web implementor Marian Konop and web engineer Gary Mort of Gotham Informatics. New Beacon members: architect Kevin Byrne; credit risk modeler (?!) Sam Browning of ZAIS Group; writer Gina Van Nosdall. Founder Scott Tillitt's other life is doing communications and PR for progressive issues and ideas through Antidote Collective. He's working with BALLE / Business Alliance for Local Living Economies to promote their 8th Annual Business Conference in Charleston, May 21-23. BEAHIVE's principles overlap with BALLE's and indeed our vision aligns quite nicely. Another new Antidote project: "One World: A Concert for Peace & Reconciliation" at the New York Society for Ethical Culture (NYC), April 24. It's a program of Arts at the Intersection, a new initiative using the arts to engage intercultural and interfaith dialogue. Thanks for reading. You're receiving this because you've given us your email to receive it (perhaps through our website, at an event, on the street, telepathically). You can remove scottlt.antidote@blogger.com at any time. But if you like what we're sending, please spread the bzzz by forwarding. (If it was forwarded, you can subscribe here.) You can also update your BEAHIVE Bzzz profile. Content is licensed under a Creative Commons Attribution-Noncommercial-Share Alike 3.0 US License. Open to the public — bring friends. Donations appreciated. We use it every day on our computers, we see it on street signs — and we take it for granted. 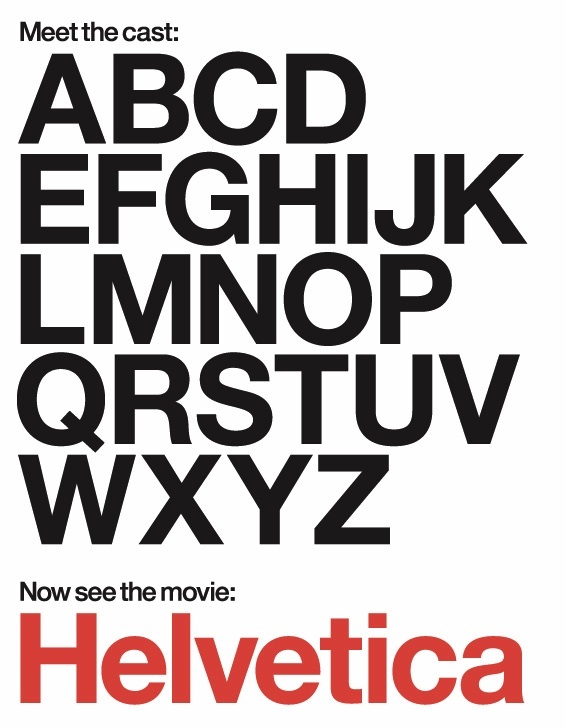 Now, Gary Hustwit's unique documentary introduces us to Helvetica, a font whose readability has made it the most popular in the world. Interviews with designers and artists offer insight into the development, use and universal acceptance of Helvetica as the typeface of choice for everything from writing letters to creating corporate logos. Each month at this intimate, informal gathering at the hive, we show a film with a message — sometimes entertaining, sometimes political, always inspiring, engaging and thought provoking. We start the evening with a kind of bring-your-own happy hour and then screen the film around 7PM. We'll have healthy, organic popcorn. Please bring something to drink and other food to share if you like. Projector generously provided by Fovea. Join us the 2nd and last Fridays each month for this series of compact, semi-acoustic and innovative music acts. Hosted by Stephen Johnson. Delicious food, great live music, and good dancing. This event is a fundraiser for The Learnalism Project, which will document projects across North America that are practicing holistic sustainability. Bring your family and friends for this festive evening. Content is licensed under a Creative Commons Attribution-Noncommercial-Share Alike 3.0 United States License, a copy of which is here. For most folks 2009 was a challenging year (to say the least). Resolve to rectify that this year. We're more than just a physical place with desks and wifi and printers. We're a diverse community of members with a range of creative and technical talents. We plan programs and events to inspire, educate and bond: personal and professional development workshops, seminars, social and cultural events. "Working at BEAHIVE has solved the isolation problem typical of solopreneurship. But more than that it has given me the chance to belong to something larger. The opportunities for valuable networking, collaboration, consultation and community are huge. I even have the sense that belonging to the hive lends extra credibility to my business. And the space itself has that artisanal sort of magnificence that is out of reach for many freelancers. BEAHIVE is special, progressive, affordable, unique and utterly invaluable." Join us as a member. Come to one of our events/programs (many are open to all). Or produce a program and help your fellow (wo)man. We have two beautiful spaces for that very purpose. Already a member? Then engage more. Take advantage of us. We like that. We have bigger plans for 2010 — togrow our community and our impact, to realize our larger vision. We quietly opened Kingston last month and so far we have 9 Founding Members (besides the Chronogram folks). Join before February 1 and you too can be one. We're kicking it in earnest this month with several regular events. See the sidebar. 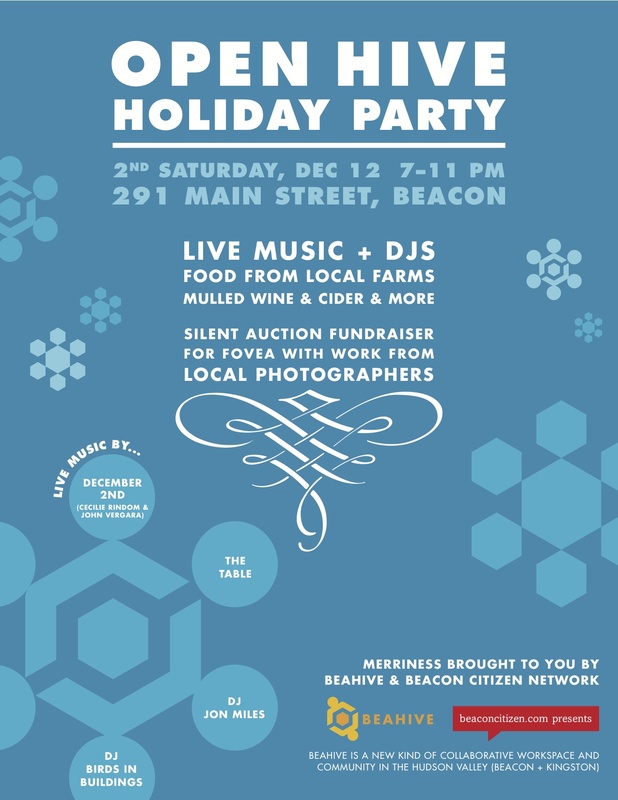 Even if you missed our BEAHIVE+BCN Holiday Party last month in Beacon, you may have heard about it. Roughly 200 people rocked the hive on Second Saturday. Fovea raised $700+ from works by local photographers at the silent auction we hosted. The buzz resonated long after the bees left the building. Check out these photos by member Paul O'Hanlon. Graphic designer (and BEAHIVE logo and materials creator) Steven Blumenthal recently started MAC MEN, personal training on the most popular Mac apps. He'll come to you or meet you at the Beacon hive on Main St. Welcome Kingston members: Beth Bengtson, Perry Goldschein and Arthur Zaczkiewicz of sustainability strategy and communications firm SDialogue; life coach Ethan Campbell of Pro Stress Relief; management consultant Chad Gomes of Booz & Company; John Lehane – founder/CTO of WAKA Kickball (! ); website designer Sean O'Dwyer of Design ICU; and Debra Seidman of Art of Massage Massage Therapy. Join the hive. Rent the hive. Hire the hive. Engage. 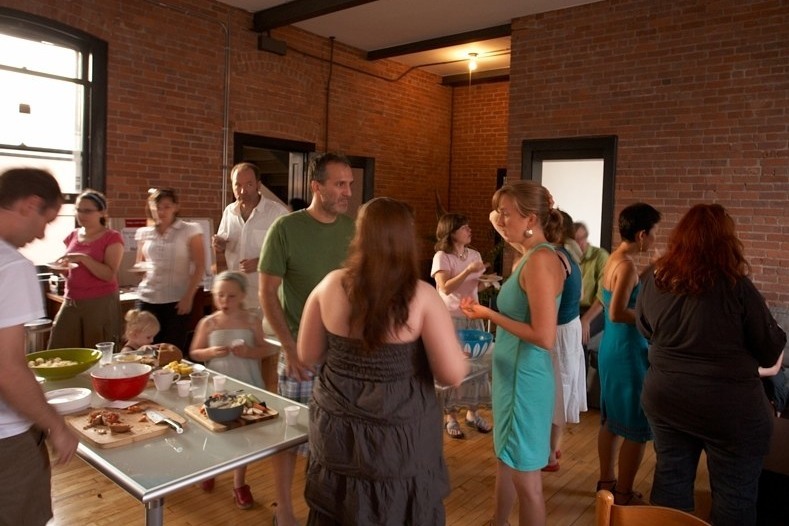 [Bzzz] December -> Membership Special / Kingston OPEN HIVE / Holiday Party! / Interns! JOIN THE HIVE. GET DECEMBER FREE. We haven't done this before but lights, sweet-smelling wreaths and merry music put us in a mood. Pay for at least one month of membership and get December free. Any level. (New members only.) Membership details: Beacon / Kingston. We're finally ready to welcome Kingston members next week. So we're having another little soirée to introduce the space and all things BEAHIVE. This is both for folks who did not make the first one — and for those already, um, orientated who want to see the space more put together. Thursday, Dec. 10. RSVP on Meetup. We love the holidays. We love parties. Voilà. We're partnering with member Kelly Kingman's Beacon Citizen Network to celebrate, BEAHIVE-style, in Beacon. Live music and DJs. Food from local farms. Mulled wine and cider. Silent auction fundraiser for our friends Fovea, the social issue photojournalism gallery (with work from local photographers). Join the merriness. People will talk about this. Second Saturday, 7PM onwards. Details. Apologies for the late notice but we have another special OPEN HIVE / film this month (WEDNESDAY NIGHT). Last month, industrial food. This month, climate change. Greenpeace lead activist Stephen Johnson is joining us to screen The Age of Stupid. He organized a similar screening at our Kingston location as part of the 350.org International Day of Climate Action in October. Roughly 60 people attended. Welcome to our two new "interns": Cecilie Rindom and Chelsea Mozen. Cecilie is a multilingual Danish singer and musician, writer, dancer, model. She's performing at our holiday party. Chelsea is director of programs (and co-founder) of Just Foreign Policy, an advocacy NGO. She has directed campaigns against the IMF and the World Bank and has an MA in Economics from the New School. Art consultant Dorothy Solomon of DSA Fine Arts curated an environmentally themed exhibition, "Altering Perceptions" that opened recently in the lobby of a 28-story building at 499 Park Ave, NYC. Kelly Kingman has a story about student life at the Culinary Institute of America (CIA) in the Nov. 15 issue of American Way ("If You Can’t Stand the Heat …"). She stayed in a campus dorm for a couple nights and went to a bunch of classes and a late-night DQ run with students. Mara Farrell graces the cover of this month's Hudson Valley Magazine. She made its People to Watch list as a "Community Activist" for her work with the Fishkill Supply Depot. These are the kinds of folks who buzz at the hive. Curious how to finance your business and where to find funds? Hear two perspectives: from a big-firm financial advisor with entrepreneurial and nonprofit experience (John Garesché); and a loan officer from our area credit union (Barry Sutton). Learn the importance of relationships, consistency and having a good business plan for your business. Both will give a back-and-forth presentation and leave plenty of time for Q&A. Bring any financial-related questions, including borrowing, investment and financial planning. Hors d'oeuvres and wine/beer served. The new four-year epic from McLibel director Franny Armstrong. Oscar-nominated Pete Postlethwaite stars as a man living alone in the devastated world of 2055, looking at old footage from 2008 and asking, Why didn’t we stop climate change when we had the chance? On September 21 and 22, on the eve of the UN General Assembly's climate session, The Age of Stupid had a global premiere billed as the "biggest and greenest live film event ever": 700 screenings in 50+ countries. Stephen Johnson, a Greenpeace lead activist, will be on hand for discussion. He organized a screening at our Kingston space as part of the 350.org International Day of Climate Action, Oct. 24. Roughly 60 people attended. A/V generously provided by Fovea.